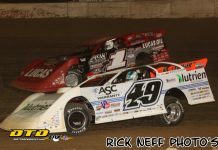 BATAVIA, NY – The Sweeney Chevrolet Buick GMC RUSH Dirt Late Model Touring Series powered by Pace Performance returned to Genesee Speedway on Thursday night for the second and final appearance of the 2018 season. The Sweeney Tour was part of the annual Genesee County Fair races for the first time ever. A beautiful night saw a big crowd pack the grandstands with 28 teams from all over New York, Pennsylvania, Ohio, and Ontario, Canada. Race #10 of the 2018 was the second annual “traveling” Manufacturers Night presented by MSD Performance that saw over $14,000 of product giveaways go to racers at Fulton, Genesee, Humberstone, and Outlaw Speedways. In the first Sweeney Tour race at Genesee on June 2, Jason Genco inherited the lead after the top three cars of John Waters, Jason Knowles, and Jeremy Wonderling tangled allowing him to go on for his first career Tour win. 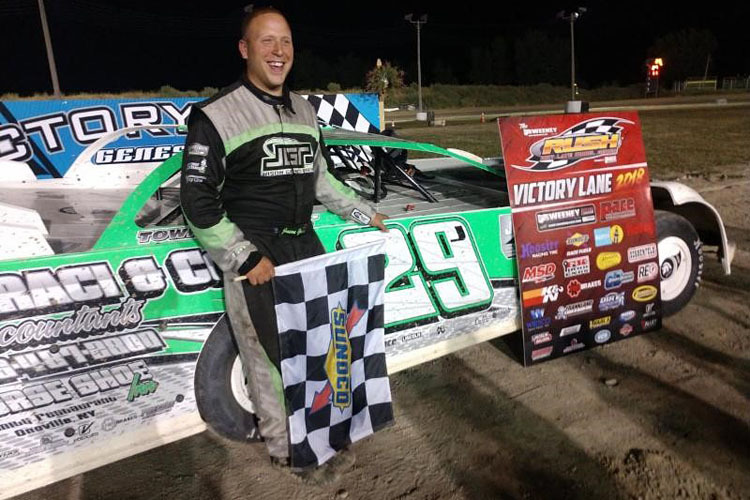 On Thursday night, Genco left little doubt he was the driver to beat leading all 25 laps of the feature giving him the sweep of both Genesee Tour races in 2018. Before the event’s only caution came out, Genco had a half-lap lead built up! The $1,500 Platinum Event win also propelled Genco into the Tour points lead for the first time in his career. After winning the dash, Genco raced to the lead on the opening lap of the feature over David Pangrazio, J.J. Mazur, Jason Knowles, and John Waters. Waters pulled alongside Knowles in the battle for fourth on lap two, while Mazur battled with Pangrazio. Those battles continued while Genco caught lapped traffic on lap eight with a half-straightaway lead over Pangrazio. Waters and Knowles resumed their battle on lap eight before Waters finally made the pass off the bottom of turn four on lap 11. Waters then closed in on Pangrazio and Mazur making it a three-car race for second on lap 15. After a side-by-side battle on laps 18 and 19, Waters was able to make the outside pass stick on lap 19; meanwhile, as those three were racing hard for second in traffic, Knowles caught the trio making it a four-car race for second. Ohio racer, Chad Sines, slipped off the track in turn four bringing out the event’s first and only caution with 22 laps scored. Genco chose the outside for the double-file restart. That was great news for Waters, who had been running the top, as when racing resumed, Waters blew around Pangrazio for second. That though would be as far as Waters would get as Genco pulled away in the final four laps to garner his third victory overall this season at Genesee in the J.P. Craig/Jason Badgley-owned, Hall Optical/All Star Insurance/Townline Auto/Jamestown Glass/Leighton Homes/955 Automotive/Big D Welding-sponsored #29J. Waters’ runner-up from sixth was good enough for the $100 Precise Racing Products “Pedal Down” Hard Charger gift card. 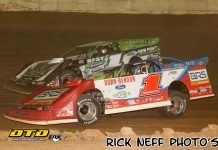 Fresh off his first Tour win of the season two events ago at Weedsport, the runner-up also moved him into a tie for third place in points after a slow start for the 2016 champion and 2017 runner-up. Pangrazio’s third place was easily his best career Tour finish topping the 20th place finish on June 2 at Genesee. Pangrazio is a two-time winner this season at Genesee, which were the first two Late Model wins of the young racer’s career. Pangrazio also had a big night in the Manufacturers drawings as he won the Lincoln Electric Power Mig 140C welder and utility cart along with a drum of Sunoco 110 or two drums of RUSH 91 with a total of value of $1,235! Mazur, who is in his second year on the Tour, was fourth matching his best career Tour finish of fourth on June 17 at Tri-City. Knowles also matched his best finish of the season in fifth. 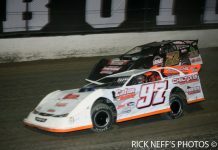 Jeremy Wonderling, who entered the night as the point leader, was sixth after starting ninth as he beat out his brother Brady by one position. Ironically the two had duplicate 17.767 qualifying times. Jon Rivers was eighth. Kurt Stebbins and Steve LeBarron completed the top 10 in their first Tour starts of 2018. Jimmy Johnson was the night’s biggest prize in the Manufacturers drawings with the full custom driver’s suit from Velocita-USA valued at $1,000. Brian Knowles was selected the Dirt Defender “Defensive Drive of the Night” recipient after holding off Beamer Guzzardi and Bill Holmes in a three-way battle for 11th at the finish. Doug Ricotta was named the TBM Brakes “Tough Brake of the Night” recipient as the transmission went out during his second lap of qualifying, which ended his night early. Genco started off the night like how he ended it setting fast time in $100 FK Rod Ends “Shock the Clock” Qualifying with a lap of 17.365. Mazur, Waters, and Jason Knowles added $25 by winning FK Rod Ends heat races. The Sweeney Tour will resume action on Friday (July 20) in a make-up event from the rained out June 1 show at Outlaw Speedway in Dundee, NY The $2,000 to-win Marquee Event will be the “Gary Montgomery Memorial” race #11 of the 2018 season. Pits open at 4 p.m. Warm-ups begin at 6 p.m. with qualifying and racing to follow. Sweeney Chevrolet Buick GMC RUSH Late Model Touring Series Race #10 (25 laps, $1,500 to-win): 1. JASON GENCO (Craig/Badgley 29J) 2. John Waters (LeBarron 11) 3. David Pangrazio (136) 4. J.J. Mazur (13) 5. Jason Knowles (4) 6. Jeremy Wonderling (3J) 7. Brady Wonderling (Ralyea z1) 8. Jon Rivers (85) 9. Kurt Stebbins (26) 10. Steve LeBarron (29) 11. Brian Knowles (7) 12. Beamer Guzzardi (12) 13. Bill Holmes (65) 14. Jimmy Johnson (39J) 15. Rob Pietz (69) 16. T.J. Downs (1) 17. Cory Lawler (93) 18. Bill DuBois (21B) 19. Bill Kessler (09) 20. Mike Greene (8) 21. Joe Long (71) 22. Chad Sines (15) 23. Adam Ferri (66) 24. Kyle Murray (21). DNQ for the feature: Bill Mesler (24B), Alan Chapman (64C), Doug Ricotta (01), Jamie Freeman (8). FK Rod Ends “Shock the Clock” Qualifying ($100 for fast time) (Track record 17.160 by Jeremy Wonderling 6/2/18): 1. Jason Genco 17.365 2. David Pangrazio 17.438 3. Jason Knowles 17.496 4. J.J. Mazur 17.568 5. John Waters 17.575 6. Adam Ferri 17.643 7. Kurt Stebbins 17.671 8. Beamer Guzzardi 17.672 9. Brian Knowles 17.684 10. Chad Sines 17.748 11. Brady Wonderling 17.767 12. Jeremy Wonderling 17.767 13. Steve LeBarron 17.781 14. Cory Lawler 17.866 15. Bill Holmes 17.897 16. Jon Rivers 17.908 17. Rob Pietz 17.982 18. Jimmy Johnson 17.994 19. Kyle Murray 18.061 20. Joe Long 18.119 21. Bill Kessler 18.230 22. Alan Chapman 18.290 23. Doug Ricotta 18.382 24. T.J. Downs 18.744 25. Mike Greene 21.001 26. Bill DuBois 23.715 27. Bill Mesler DSQ (light) 28. Jamie Freeman DSQ (fuel cell). FK Rod Ends Heat 1 (8 laps, top 6 transfer, $25 to-win) 1. Mazur 2. Genco 3. Rivers 4. Stebbins 5. LeBarron 6. Murray 7. Sines 8. Chapman 9. Greene 10. Freeman-DSQ. FK Rod Ends Heat 2 (8 laps, top 6 transfer, $25 to-win): 1. Waters 2. Pangrazio 3. B. Wonderling 4. Guzzardi 5. Pietz 6. Lawler 7. DuBois 8. Long 9. Ricotta-DNS. FK Rod Ends Heat 3 (8 laps, top 6 transfer, $25 to-win): 1. J. Knowles 2. B. Knowles 3. J. Wonderling 4. Ferri 5. Johnson 6. Holmes 7. Downs 8. Kessler 9. Mesler. Last Chance B Main (8 laps, top 6 transfer): 1. Sines 2. DuBois 3. Downs 4. Kessler 5. Long 6. Greene 7. Mesler 8. Chapman-DSQ (light) 9. Ricotta-DNS 10. Freeman-DSQ. Dash (6 laps): 1. Genco 2. Pangrazio 3. J. Knowles 4. Mazur 5. B. Knowles 6. Waters. RUSH Late Model marketing partners include Sweeney Chevrolet Buick GMC, Pace Performance, Hoosier Tire, Bilstein Shocks, Sunoco Race Fuels, Bazell Race Fuels, Insinger Performance, MSD Performance, Holley Performance Products, Earl’s Performance Plumbing, Quick Fuel Technology, FK Rod Ends, Schoenfeld Headers, Jones Racing Products, Racing Electronics, Dirt Defender, Dynamic Drivelines, Wrisco Industries, Frankland Racing Supply, Alternative Power Sources, Precise Racing Products, TBM Brakes, K&N Filters, Lincoln Electric, Pancho’s Racing Products Velocita-USA, Classic Ink USA, Landrum Performance Spring, Schwartzmiller Ground Maintenance, CrateInsider.com, RockAuto.com, and Valley Fashions.